It’s said that perfume was reserved for the gods, and there is definitely something otherworldly about finding a great fragrance. Britain’s first classically trained nose, Lyn Harris knows the importance of finding the ideal scent. Inspired by everything from her childhood trips to Scotland and the “damp, wet, and mossy” landscapes of Yorkshire to the lilacs and pines near her north London home, Lyn Harris has created scents for Jane Birkin and Manolo Blahnik, establishing brand Miller Harris before setting up her boutique perfumery, Perfumer H in 2015. Offering a seasonal collection of scents and candles, the Marylebone atelier also provides a bespoke fragrance service, whereby Harris will craft your own, one-of-a-kind scent. 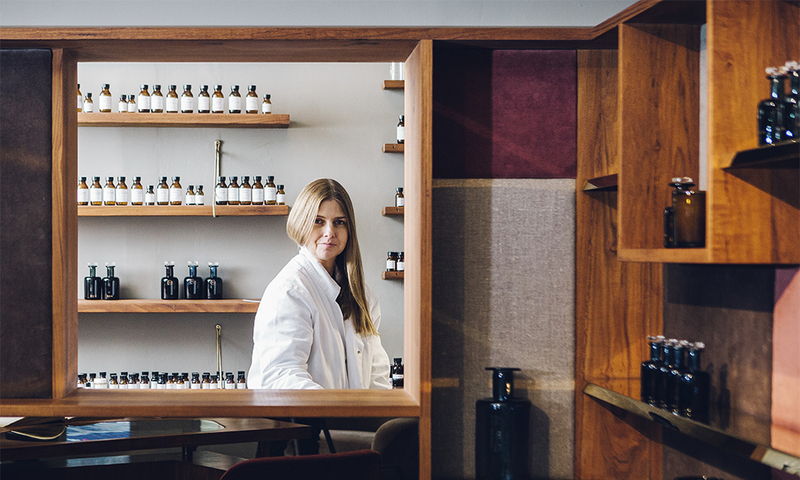 Lyn Harris creates her signature scents in her lab in Marylebone, London. Finnair flies to London six times a day. Perfumer H’s resident Border Terrier, Pop. “What I’m creating are beautiful smells that give way to a feeling, an emotion, a picture, a painting, or a name… and the story they portray,” says Harris. At a time when consumers are demanding a more personal, unique experience, Perfumer H’s products couldn’t be more fitting.